In 1989, Jodi Bardinelli introduced me to Martha Stewart — by way of Martha’s recipe for old-fashioned bottom-crust apple pie. It’s one I’ve since replicated in one form or another many times. “Oh my God! This is delicious!” I said when she brought that just-baked pie to work at Saleh al Lago, where we met waiting tables. Jodi later introduced me to her daughter Jessi, then a second-grader, who today tends bar at Russell’s in Bothell. 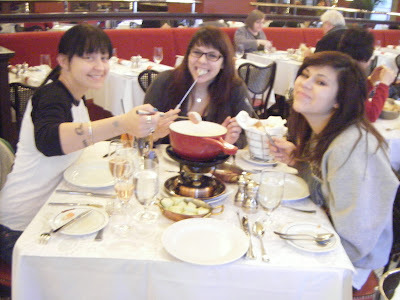 And later still to the peripatetic Italian restaurateur who’d become the father of Jessi’s baby sisters, Ornella (now 20) and Oriana (17). In the years since, we’ve shared recipes and cookbooks, tales of love and marriage gone awry, and not a few laughs over what Jodi always referred to as “two-cocktail stories.” But I wasn’t laughing when she called in November to tell me she was sick. “How sick?” I asked. “Sick sick,” she answered. It turns out the exhaustion she’d been experiencing this summer didn’t stem from her hard work managing Kirkland’s Wednesday farmers market, the special events she helped direct nor the caterings she worked to help make ends meet. And the shortness of breath she’d been worried about recently? It wasn’t from stress as she’d been told, though she’d had plenty of that lately — not that she complained. Jodi, 49, had a virulent form of liver cancer that had spread to her lungs. 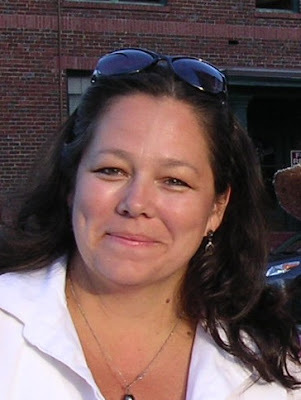 She died at home in Kirkland December 30, less than two months after her diagnosis. Her daughters and their fathers (Luciano Bardinelli and Paul Dickason) were with her when she passed. I can’t tell you how sad I am to lose my friend, but if you’ve lost one yourself, I’m sure you know how I feel. 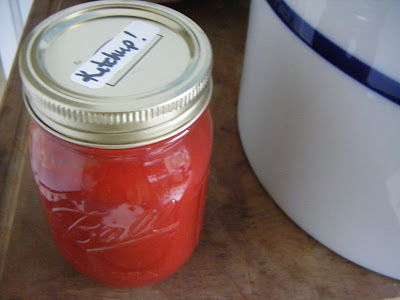 I love this ketchup, and so will you, which is why I’m sharing Jodi’s recipe at the end of this post. After our Husky-Border Collie mix Maia Wolfe died just over a year ago, Jodi arrived with the tear-jerking kid’s book, “Dog Heaven” in hand. And when she showed up this summer so we could tool around the Edmonds Farmers Market together, she came bearing an oversized Italian tomato can, dirt, worms and oatmeal — a do-it-yourself compost kit she’d fashioned for my boy, whose favorite lunch is a “Jodi Bardinelli Sandwich” (her recipe for Italian meats and cheeses, layered with fresh basil and olive oil in a hollowed out loaf of rustic bread). My pal loved spending time in the kitchen, and was one of the best home-cooks I know. Remember when I blogged about Tomato Day — when I helped can 800 pounds of fresh Roma tomatoes? Guess who showed me how it’s done? 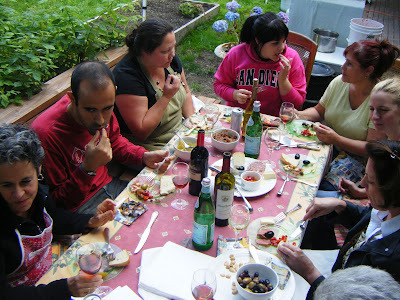 Jodi (in green apron), enjoying time around the table on “Tomato Day” 2008. And maybe you recall me carrying on about Pedro Esquivel, the Yakima farmer who sold roasted chilies at the Kirkland Wednesday Market. It was Jodi who insisted, “You’ve got to meet him, Nance! He’s amazing.” Of course, she said that about all “her” KWM farmers, ranchers and other food producers — as well as the posse of great friends she’d made over the years. But the people she loved and cared about the most, the ones who truly never ceased to amaze her, were her girls, who cared for their mom at home at the end of her too-short life, and who will miss her most of all. “There was only one thing my mom ever wanted to be,” Jessi told me the other day, “and that was a mom.” It was something she did exceedingly well, the sisters agree. Whether it was teaching them how to cook, pickle, preserve, sew, work hard, be considerate or display good manners (“Napkin on your lap!” “No texting at the table!”), Jodi took her most important job seriously. Jessi says she won’t ever forget the time she spent with her mom when she was little and it was just the two of them driving around in the car singing “Sugar Pie, Honey Bunch,” or dining out at fancy restaurants like the Adriatica, where Jodi once worked and where Jess learned to love Baked Alaska. 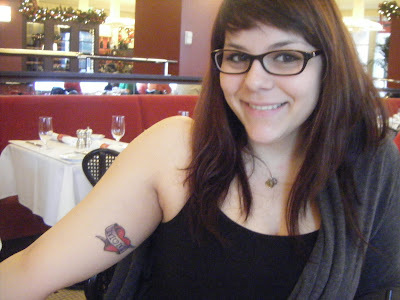 Nella’s tattoo. Who do you love? Oriana, a high school senior, insists it’s her intention to gift her mom with the best tattoo of all. Or so she said last week over lunch, when we offered a toast to Jodi — who I imagine must be in God’s kitchen right this moment, feeding osso buco to the dogs in Heaven. And what tatt is that? “No tattoos!” said Little O. And now, as promised, here’s my gift to you: Jodi’s ketchup recipe, with her notes in parentheses. It helps if you’ve got a working knowledge of the canning process, to say nothing of the right equipment. Which, in the best of all worlds includes a commercial tomato press — something Jodi treated herself to a couple years ago. “The Natester” — crushing tomatoes and wishing he had a Jodi Bardinelli Sandwich. 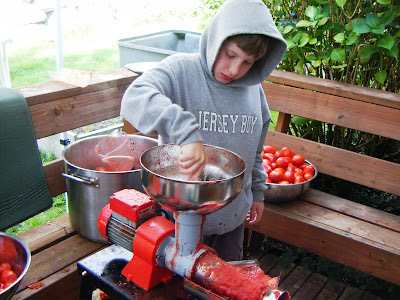 But even if you don’t have that luxury, having friends and family who love you assist while you’re “making jars” Jodi-style should make the time spent pressing tomatoes through a sieve pass all-too-quickly. Tie celery seeds, cloves, cinnamon sticks and allspice in a square of cheesecloth, creating a spice bag. In a stainless steel saucepan, combine vinegar and spice bag. Bring to a boil over high heat. Remove from heat and let stand for 25 minutes. Discard spice bag. Meanwhile, in a large stainless steel saucepan, combine tomatoes, onions and cayenne. Bring to boil over high heat, stirring frequently. Reduce heat and boil gently for 20 minutes. Add infused vinegar and boil gently until vegetables are soft and mixture begins to thicken, about 30 minutes. Working in batches, transfer mixture to a sieve placed over a glass or stainless steel bowl and press with the back of a spoon to extract all liquid. (Are you kidding? Tomato machine!!!!) You can also do this in a food mill. Discard solids. Return liquid to saucepan. Add sugar and salt. Bring to boil over medium heat, stirring occasionally. Reduce heat and boil gently, stirring frequently, until volume is reduce by half and mixture is almost the consistency of commercial ketchup, about 45 minutes. Meanwhile prepare canner, jars and lids. Ladle hot ketchup into hot jars, leaving 1/2-inch headspace. Remove air bubbles and adjust headspace, if necessary, by adding hot ketchup. Wipe rim. Center lid on jar. Screw band down until resistance is met, then increase to fingertip tight. Place jars in canner, ensuring they are completely covered with water. Bring to a boil and process for 15 minutes. Remove canner lid. Wait 5 minutes, then remove jars, cool and store.